A sad week last week because our friend and nephew Keith passed away and we’ll miss him. I won’t say more about that. Great Carrs buttress is at the head of the Greenburn Valley, immediately south of Wrynose Pass. 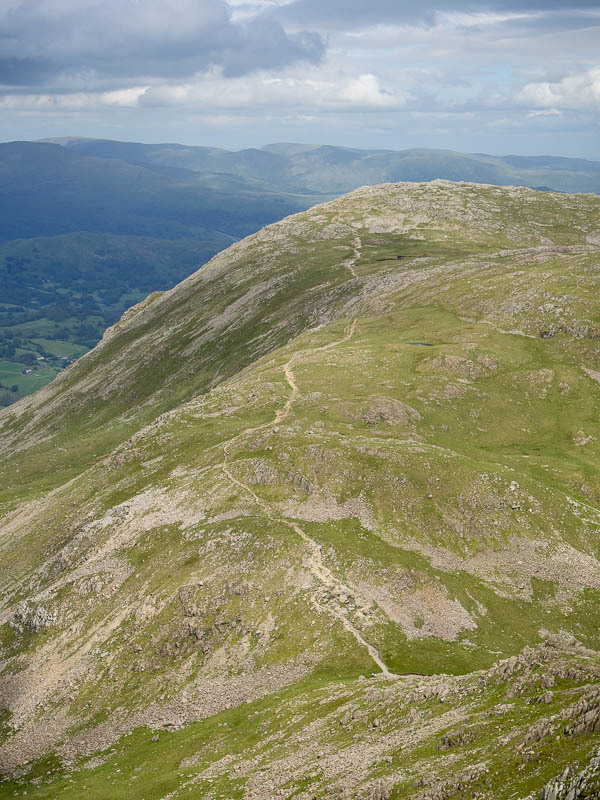 It’s described in Brian Evans’ book “Scrambles in the Lake District”, as a two star grade 2 route. I’ve been thinking about it for many years. I parked in Wrynose Pass, as near to Fell Foot bridge as I could. The fields in the valley are looking beautiful at the moment, full of yellow flowers, and cow parsley on the road edges. Langdale Pikes from Fell Foot bridge. You cross Fell Foot bridge and walk south for a short half mile to pick up the track leading into the Greenburn Valley. 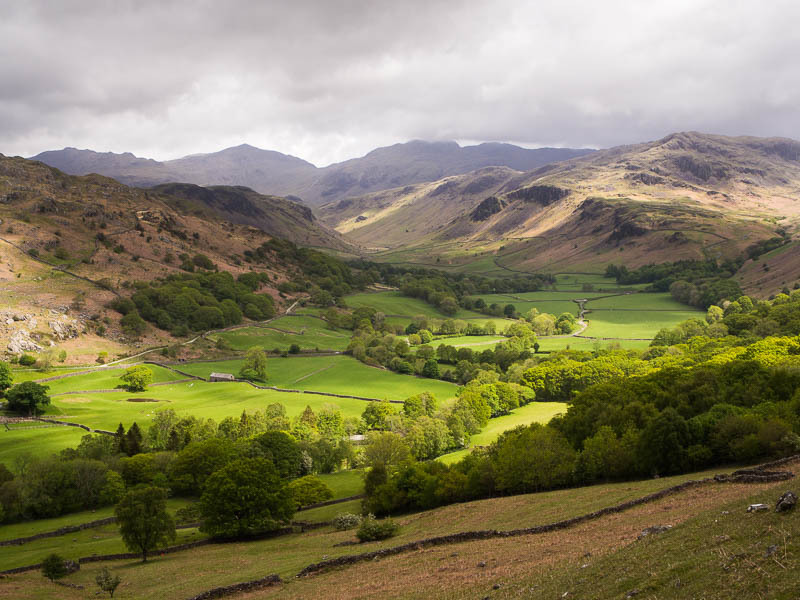 The views of the Langdale Pikes from Fell Foot are really spectacular, perfectly framed by Wrynose Fell on one side and Lingmoor Fell on the other. The track leads easily up the valley until you get to a gate through the wall that forms a National Trust boundary. More on this later but for now, note that there’s a track straight ahead keeping to the valley floor (which we’ll take) and a path on the right over a bridge, but no trace of any path on the left. Remember this fact. Follow the track as it becomes a path up to the old mines, past the reservoir and then the path gives out and you’re following your nose along the valley bottom heading for the valley head. Eventually you reach what I assume is a glacial moraine and standing on top of this you can see the whole cwm and the line of the scramble. 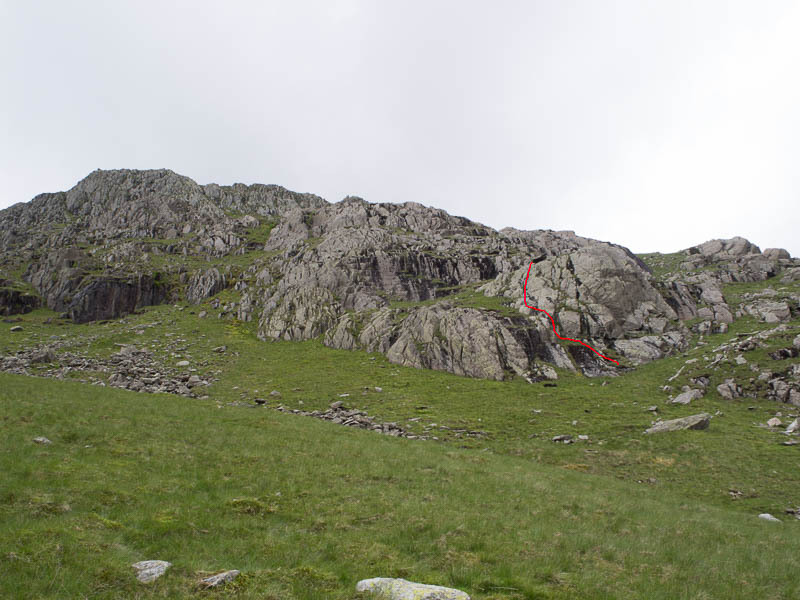 The approximate line of the route of Great Carrs Buttress, see from the moraine at the entrance to the cwm. The “blunt nose capped by a perched boulder” can be seen if you skirt up to the left and then step back a little. The boulder is about a metre wide and squat. The picture in the book is a good guide to the route. 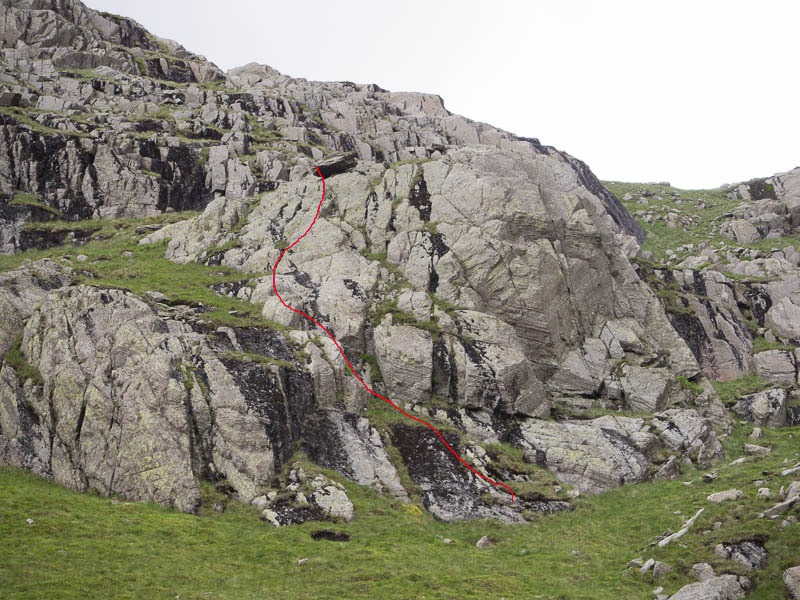 The start of the route up to the balanced boulder mentioned in the book, up the groove to the slabs. If you have walked up to the base of the route, you have to walk leftwards (southwards) to get this view, from where you can more easily see the boulder. 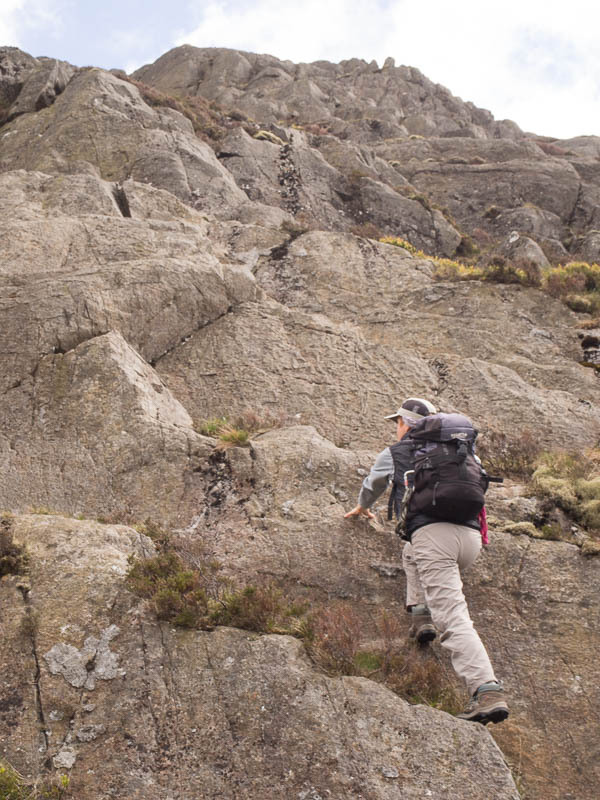 Up the groove to slabs and up to the boulder. My first try at the start – “…a rock groove gives access to slabs…” – is a false start and I back off. The groove is slimy and holdless but a little to the left is another, much easier, groove leading to slabs and everything is OK. The rock is nice but wet moss doesn’t encourage going off route. 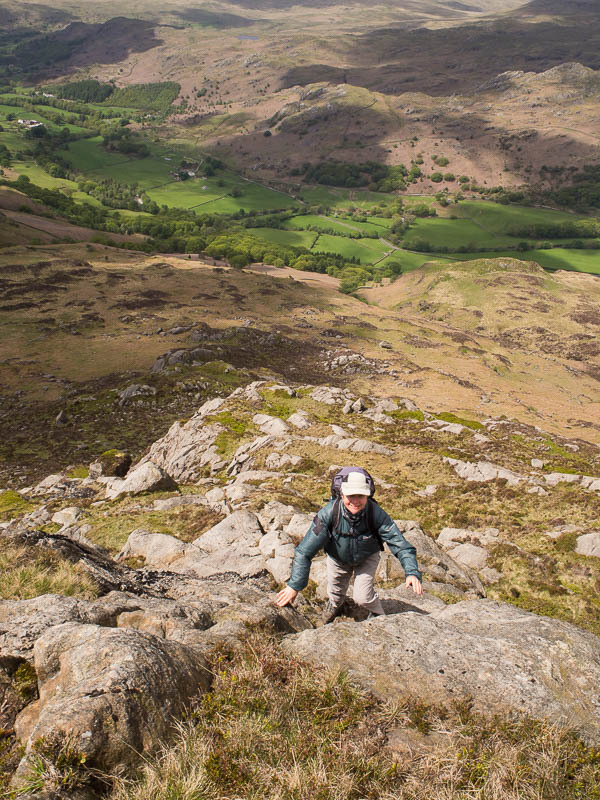 It’s easily escapable, a series of rock steps with grass between until you get higher up and you need to cross over the scree and loose boulders to your right to reach the top spiky ridge. 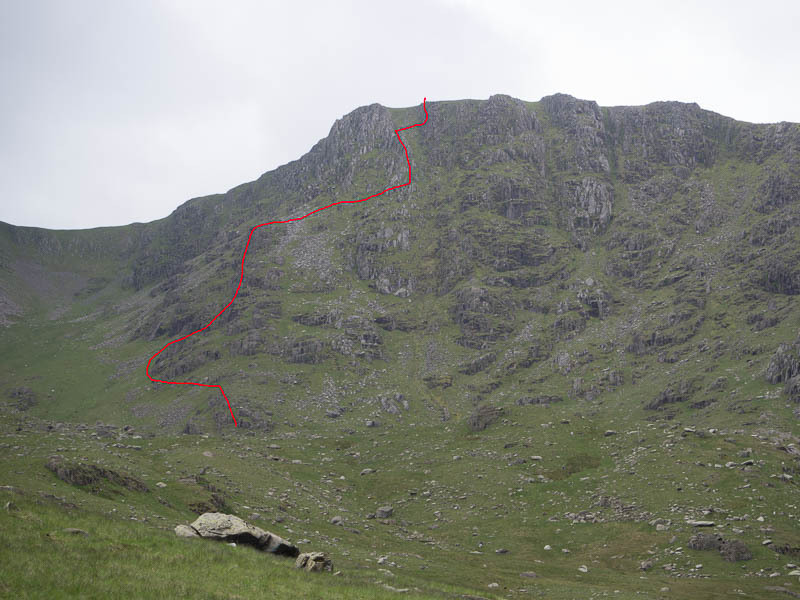 The spiky ridge in the top half of the route, with the gully to your immediate right. It’s quite easy and safe scrambling. This ridge becomes obvious once you reach the deep straight gully (which was very obvious from when you were standing on the moraine earlier). As promised its full of spiky holds. Near the top there’s a choice of lines, all attractive. I crossed the gully to take what I hoped was a nice long sweep of good rock. The scrambling finishes as a good scramble should, at the summit of Great Carrs. 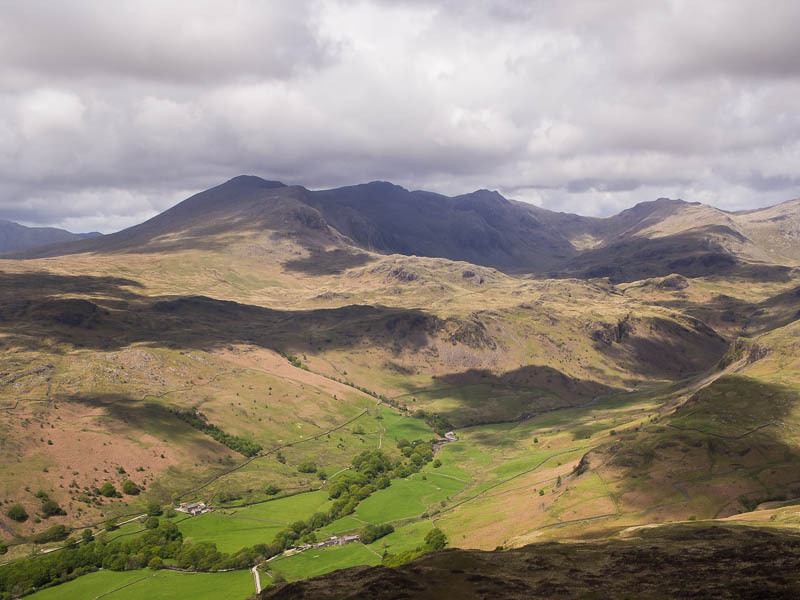 The views are panoramic and tremendous – the Langdale Pikes, Crinkle Crags, Bowfell, the Scafells, Harter Fell and Eskdale, the sea west and south-west, Wetherlam, etc. 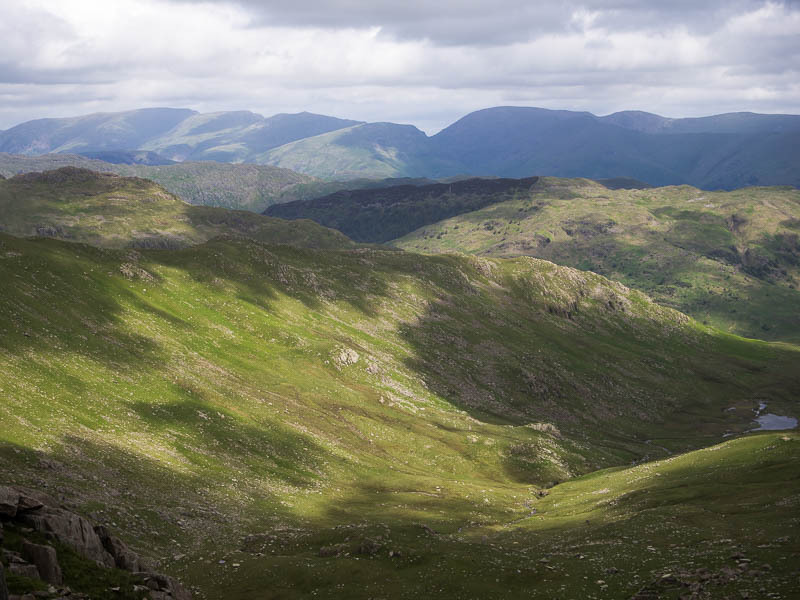 Greenburn Valley from Great Carrs, Wetherlam on the right. 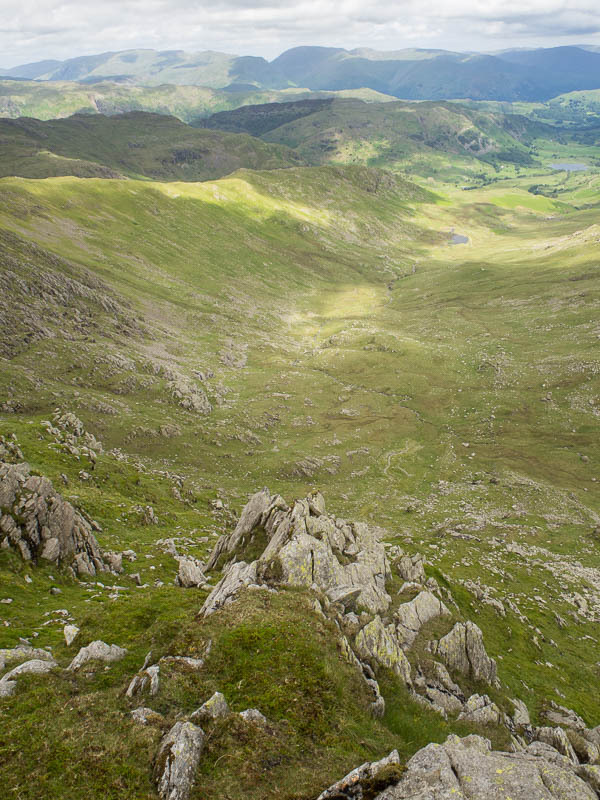 Greenburn Valley from Great Carrs, the spiky ridge of the scramble immediately in front, Wet Side Edge on the left. Great Carrs summit. 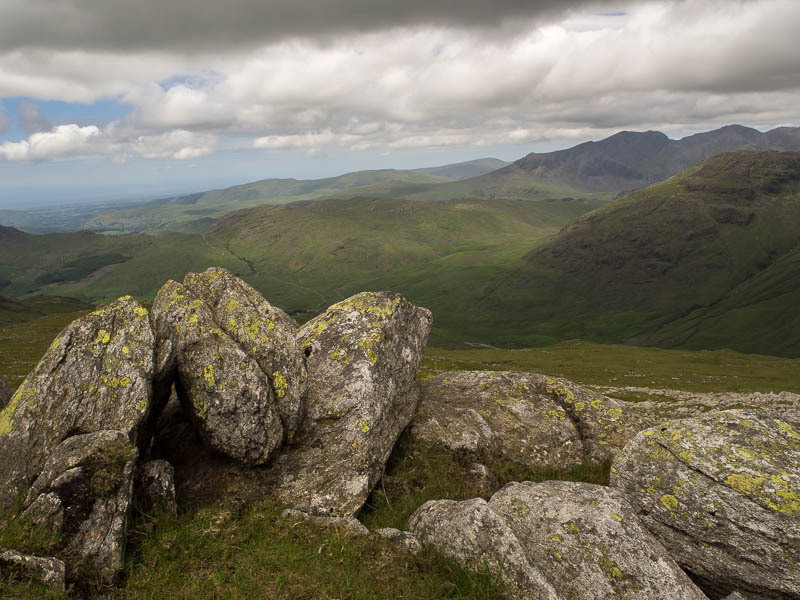 Scafell in the distance on the right. I hadn’t planned beyond this so I looked at the map to see what I could make of the day. 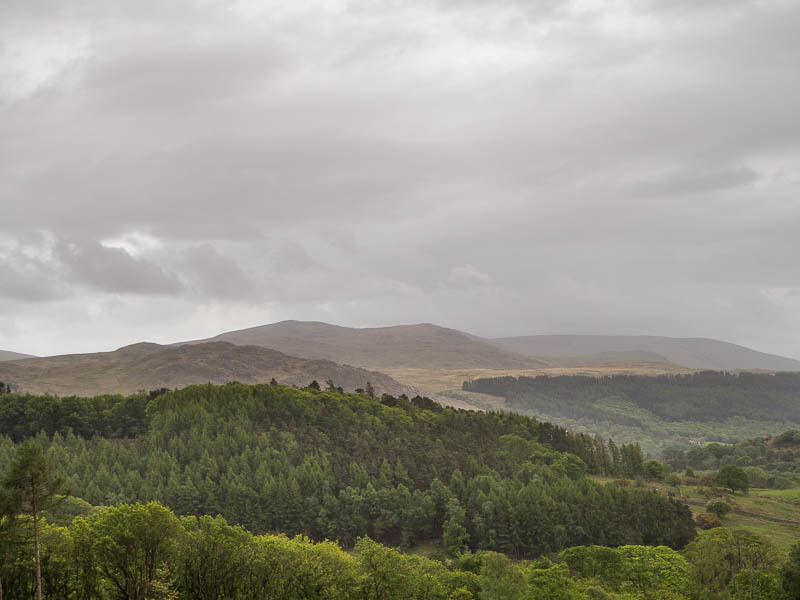 I decided to go south along the ridge to Coniston Old Man and then straight back again to Swirl How, then I’d decide further. The going is quite easy along the fairly level ridge until Levers Hause. 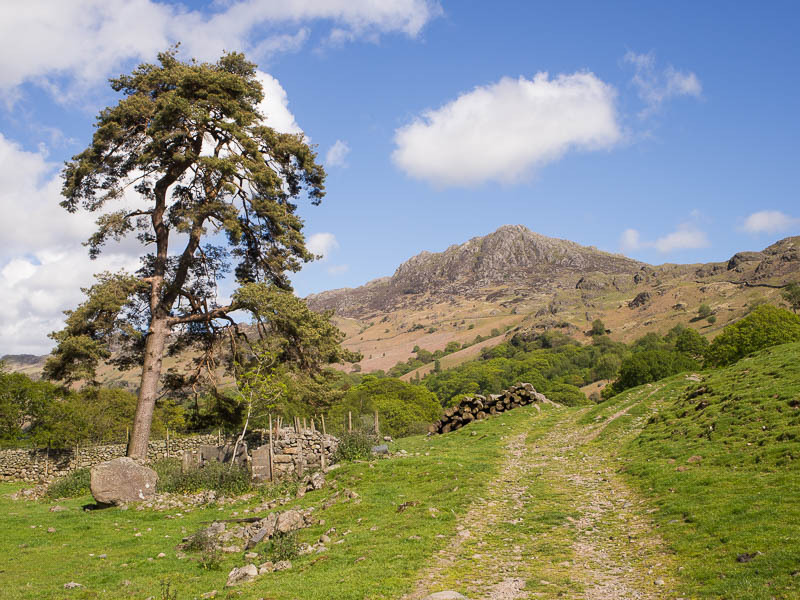 The view of the Old Man and Dow Crag is particularly good. 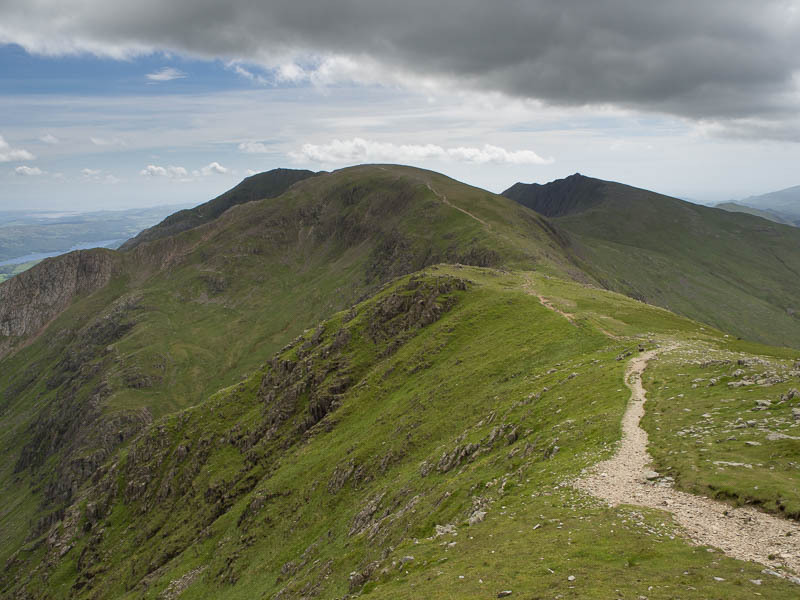 The route from Swirl How to Coniston Old Man (left-hand distant summit) with Dow Crag as the pointy distant summit on the right. After Levers Hause it steepens again until Old Man summit. I think I’ve only been on here once before and I couldn’t remember it but its particularly nice. 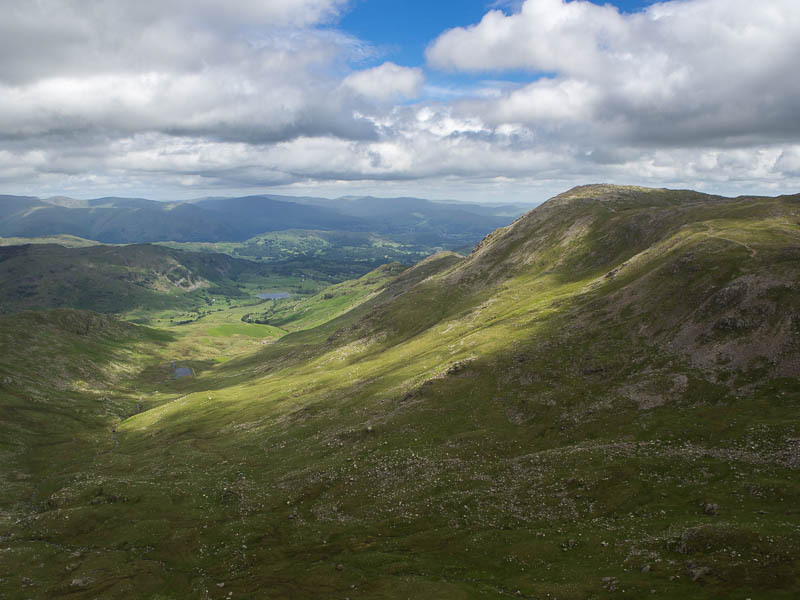 I didn’t stop long, taking plenty of pictures of the views south to the sea, and east to Coniston water and Windermere. 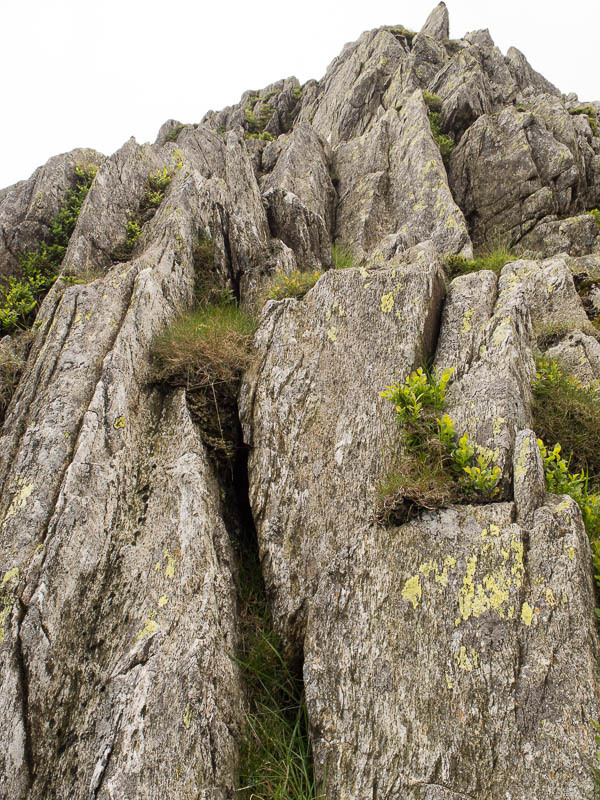 There’s also a fantastic head-on view of the climbing crags of Dow Crag, though I didn’t see any climbers despite the good weather. Normally you hear them first, their big hexes clinking about like Swiss cow bells and the calls of “on belay”, “climb when ready”, “aaaggghhh”, etc. 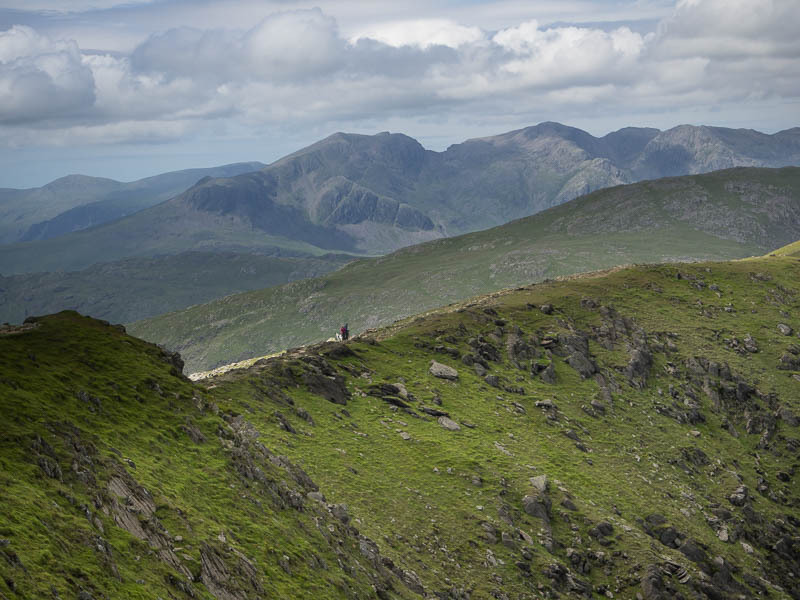 Looking back from Old Man summit to the return path, the Scafell range in the distance. 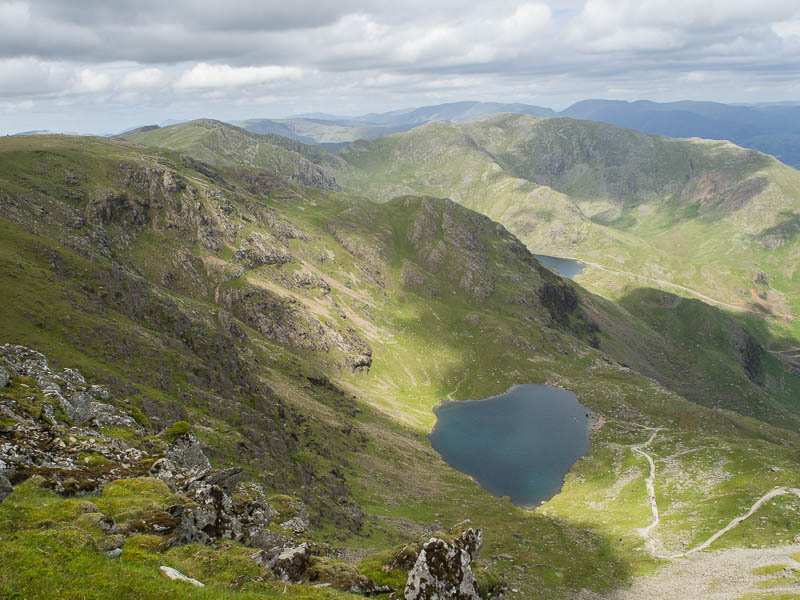 The view north from Coniston Old Man, Levers Water immediately in front, Wetherlam in the distance on the right. Back quickly to Swirl How and the return route across Wetherlam wins out, though I’d also like to try the Wet Side Edge route some day. This return takes longer than I thought. 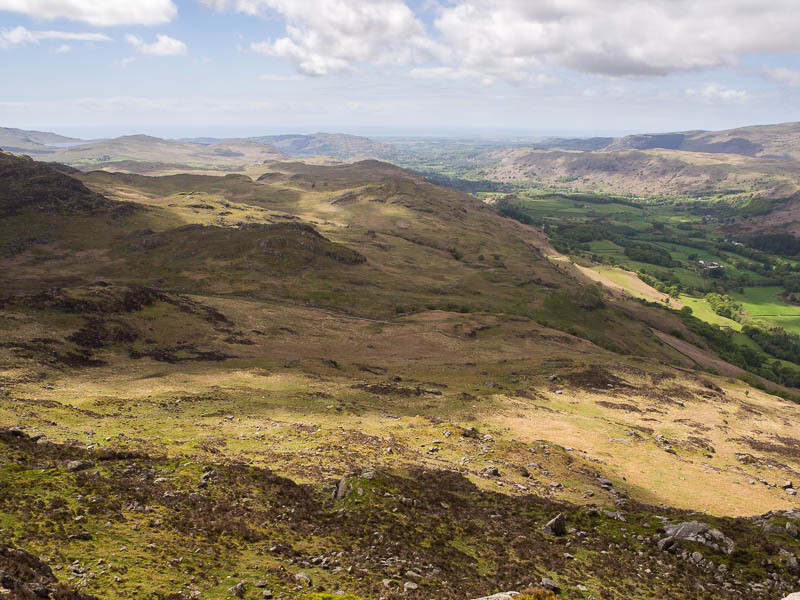 It’s a very rough descent down to Swirl Hause, a rough and steep re-ascent to Wetherlam, and another steeper and rougher descent down Wetherlam Edge, but makes for a very good and sporting day. Looking down to Swirl How from Swirl Hause with the path to Wetherlam summit beyond. I was on the lookout for the return path. 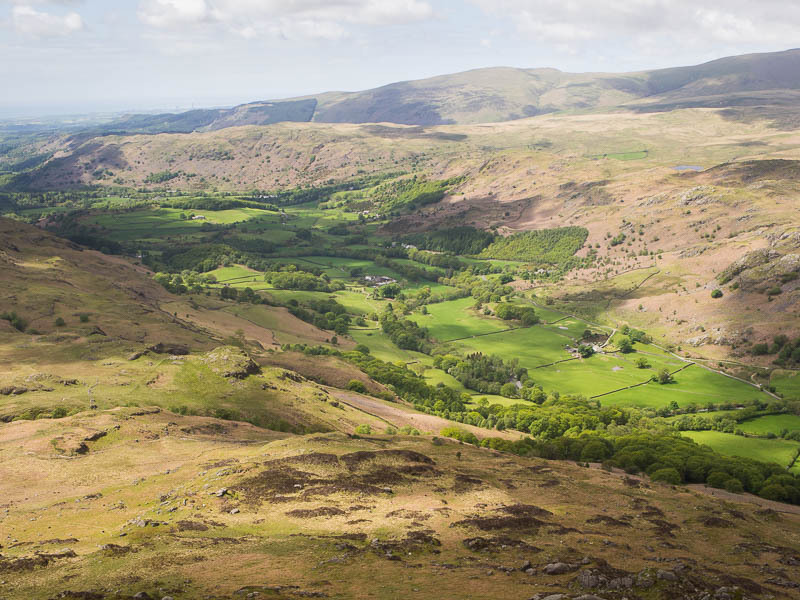 The OS map shows a path leading north-north-west from grid reference 293 016, cutting a slanting path across the side of the hill and finishing in the valley at the National Trust boundary wall I talked about earlier (remember that?) I looked very carefully, used all my navigation skills, but couldn’t see any obvious path. There is a nice grassy rake that I thought might be it so I followed it. The danger with routes along the side of steep hills is when the hillside steepens to crags above and below so I was careful not to get stuck. The rake petered out and I used the compass which told me that the path I wanted should now be below me, though I couldn’t see anything. I decided just to strike straight down the hillside from where I was. I could see the terrain so I knew I wouldn’t get into any trouble. It was steep and rough but fine. Don’t try this later in the year when the bracken has reached chest height though. Further compass checks told me the path should now be above me. I was now getting fed up and decided there was no path. 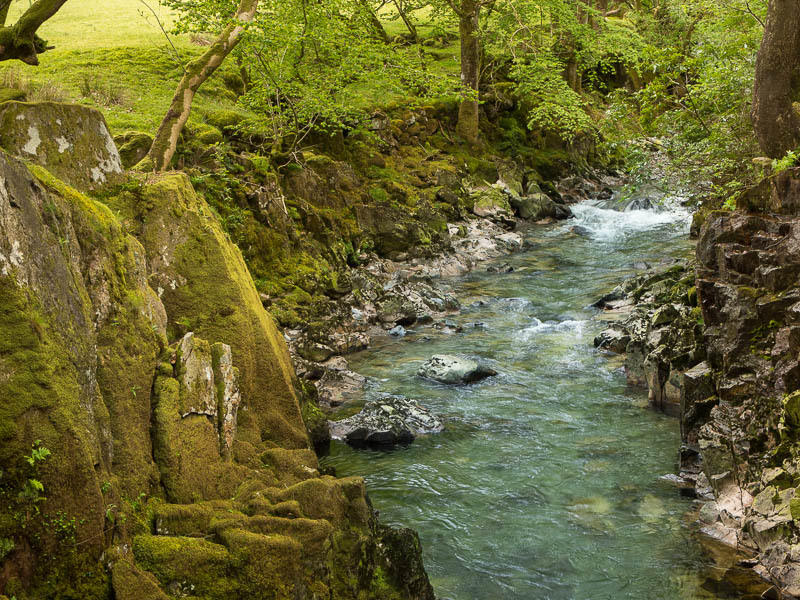 I just followed my eyes and nose through the bracken and sparse boulders and rocks until I hit the outward track on the valley bottom. I had found a path some way down and I followed it rightwards but it was leading uphill so I gave up on it after a few hundred metres. So, arriving at the NT boundary wall again I looked back. The path I had been looking for, and which is marked on the map, just doesn’t exist. Not a big problem as long as you know but wouldn’t have been so nice later in the year in high bracken. 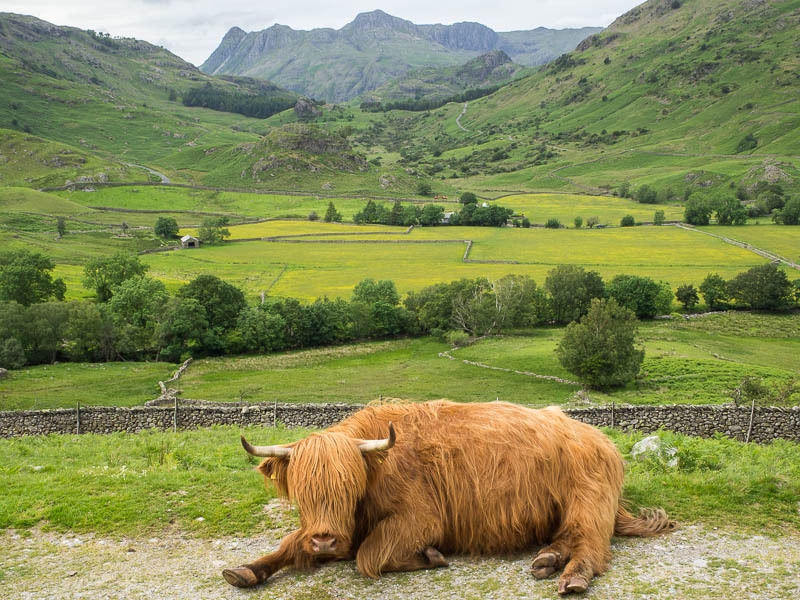 Langdale Pikes from the valley with a hot bovine relaxing in the heat. 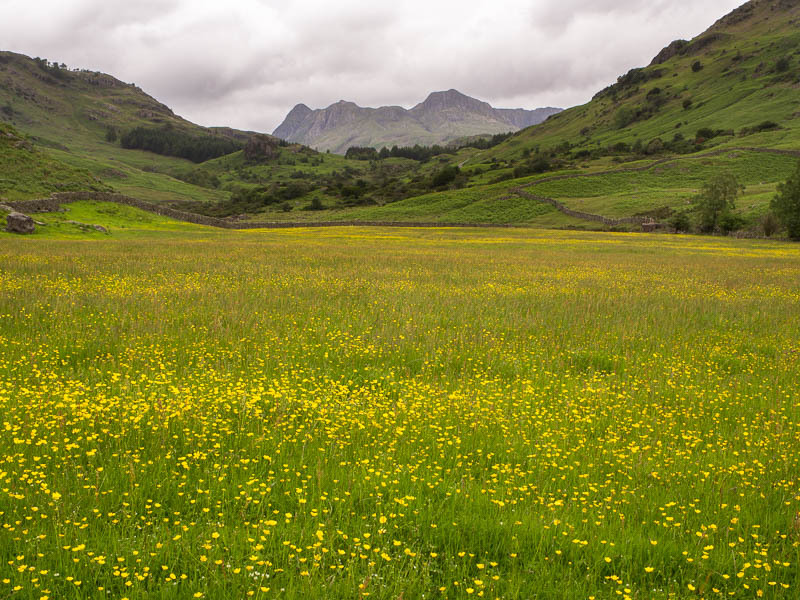 Now a short walk back to the car and more pictures of the Langdale Pikes with yellow fields. The scramble is very worth doing, a nice line on nice rock, easily escapable and not needing a rope for reasonably competent scramblers.